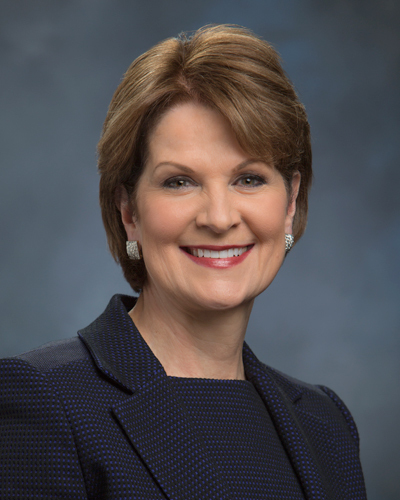 Marillyn A. Hewson is Chairman, President and Chief Executive Officer of Lockheed Martin Corporation. She previously held a variety of increasingly responsible executive positions with the Corporation, including President and Chief Operating Officer and Executive Vice President of Lockheed Martin’s Electronic Systems business area. Ms. Hewson joined Lockheed Martin more than 30 years ago as an industrial engineer. During her career she has held several operational leadership positions, including President of Lockheed Martin Systems Integration; Executive Vice President of Global Sustainment for Lockheed Martin Aeronautics; President and General Manager of Kelly Aviation Center, L.P., an affiliate of Lockheed Martin; and President of Lockheed Martin Logistics Services. She has also served in key corporate executive roles, including Senior Vice President of Corporate Shared Services; Vice President of Global Supply Chain Management; and Vice President of Corporate Internal Audit. Ms. Hewson has served on numerous boards and currently sits on the Board of Directors of DuPont; the Congressional Medal of Honor Foundation; the Board of Governors of the USO; the Board of the National Geographic Education Foundation; the Board of Visitors of the University of Alabama’s Culverhouse College of Commerce and Business Administration; and the Board of Directors of Catalyst. Ms. Hewson is a former Chair and current member of the Executive Committee of the Aerospace Industries Association; a Fellow of the Royal Aeronautical Society; an Associate Fellow of the American Institute of Aeronautics and Astronautics; and a member of the International Institute for Strategic Studies. She is a Director of the Atlantic Council’s International Advisory Board and a Vice Chair of the Business Roundtable. Ms. Hewson also serves on the Board of Trustees for King Abdullah University of Science and Technology in the Kingdom of Saudi Arabia and on the Board of Trustees for Khalifa University of Science and Technology in the United Arab Emirates. In 2016, Fortune magazine identified Ms. Hewson as one of the “50 Most Powerful Women in Business” – naming her No. 3. That same year, Forbes released its global ranking of the “World’s 25 Most Powerful Women,” listing her at No. 24. Born in Junction City, Kansas, Ms. Hewson earned her Bachelor of Science degree in business administration and her Master of Arts degree in economics from the University of Alabama. She also attended the Columbia Business School and Harvard Business School executive development programs. Every year, the Edison Awards honors one or more individuals who, through their careers, their leadership and their achievements, have distinguished themselves by making a significant and lasting contribution to the world of innovation. View more Edison Achievement Award Winners.